Let’s see how web application automated testing is done with Testsigma. We shall take a login scenario for OrangeHRM. If you haven't heard of it before, It is an online HR and Leave Management application. 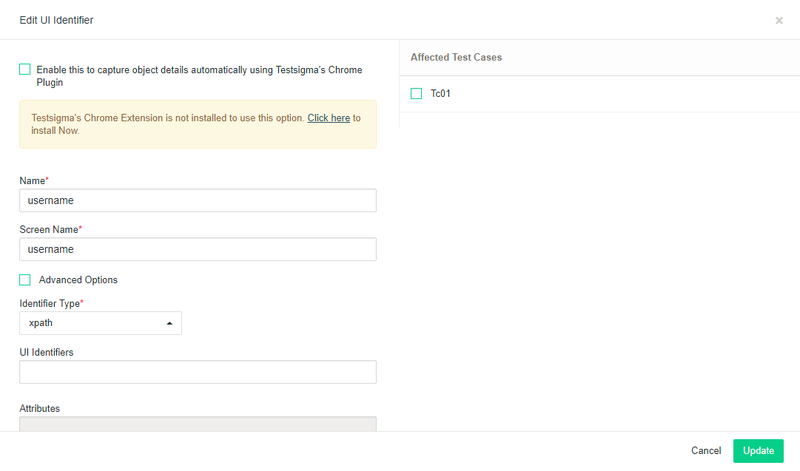 Let us try automating the above Test Case(4 Test Steps) with the above Test Data using Testsigma now. When an account is created in Testsigma for the first time, a default project named “Testsigma Examples” will already be available that contains an application, an application version, a few test cases with some test steps. We may use the same project in this case. You may also start by creating a new Project, application, and version and manage them easily. Let us create a new Project now. Click on Create New button on the left Navigation bar and then click on Project in the overlay that pops up. Enter the following details in the Create Project page that opens up. Click on Create button at the bottom right corner to Create the Project, Application and Version in a single step. You will be taken to the Test Cases page. Click on "+ Test Case" button on the top left corner to open the "Create Test Case" page. Choose Automated since we are going to create an automated Test Case. Enter the name of the Test Case with a relevant description and click Create. You will be taken to the Test Case Details page. Testsigma uses a set of predefined Natural Language statements to write automated tests without programming even a single line of code. Let's add the 4 Test Steps this way. Test data is nothing but the user inputs, e.g. names like Alice, Bob, a phone number or a website/application URL, etc. 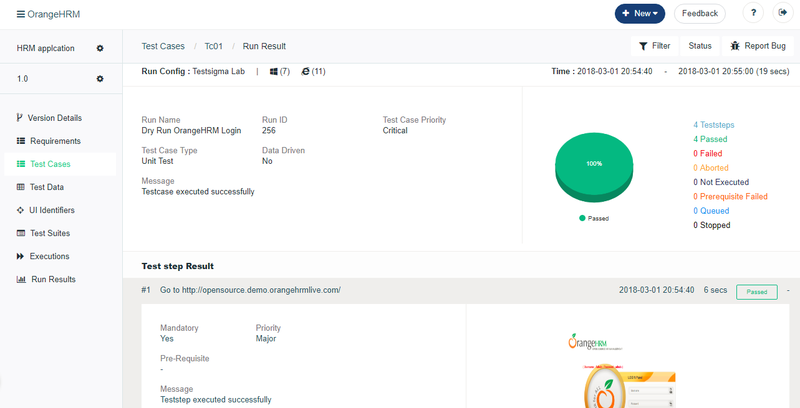 In our case, the application url (http://opensource.demo.orangehrmlive.com/), the username (Admin), the password (admin123) are all test data. One step is completed! That was easy! Now, let’s create the second Test Step to enter the user name value(Admin) in the Username field. Click on Add Next Test Step to open the Test Step creation wizard. UI identifiers in Testsigma are locators used to locate an element (an input field, link, image, button, etc) in a web page. While entering the UI Identifier name, you might get suggestions if a UI Identifier with similar name has been created before. Select the UI Identifier name from the suggestions if you are sure that the one you need to use is already created. Here, let us assign the UI identifier value. You can assign it either manually or using our Chrome Recorder extension. In Manual method, you can select the Identifier type such as ID, Class Name, XPath e.t,c and enter the UI identifier value in the UI Identifiers field. Once the UI Identifier is updated, Click on Create and Continue to create the Current Test Step and proceed to creating the next Test Step. As in previous step, start typing “type” in the Action text field and choose Type test data in ui identifier from the suggested NLP. Click on Create and Continue to create the Current Step and move onto next step. Now, Let's see how a click operation is performed in Testsigma. We need to click on the Login button to submit the Username and Password. As in previous step, start typing “click” in the Action text field. There’s no need for Test Data or input in this case. We do not have any input to enter but UI identifier to locate this click button. So, let us choose the grammar Click on ui identifier. Replace the ui identifier part with a variable, say, 'submit'. Let us record the UI identifier for the Login button on the OrangeHRM page. Click on Create button rather than Create and Continue since this is the last step. There are 3 Execution methods in Testsigma. Dry Run is the quickest method to execute individual Test Cases in Testsigma. Quick Executions and Regular Executions can be used to execute multiple Test Cases and Test Suites(a group of Test Cases). 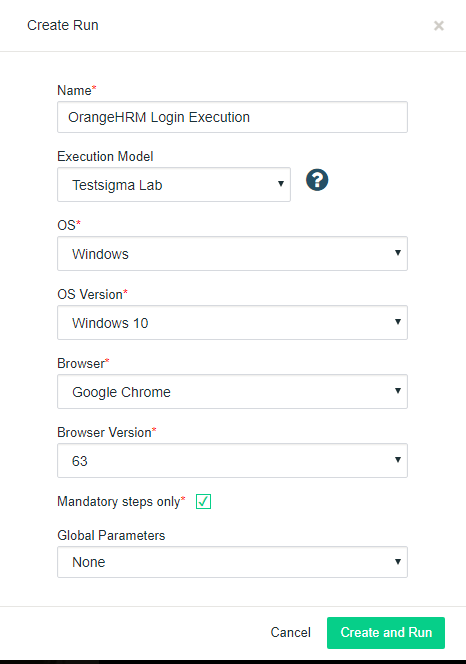 Quick and Regular Executions can be done on your local devices (Hybrid Execution), on Testsigma's very own cloud infrastructure called Testsigma Labs and also on third-party platforms like BrowserStack and Sauce Labs. Simply click on 'Run' at the top right corner of the Test Case details page. In the next page that opens up, enter the details of the execution like the Name of the Execution, The Operating System, its version and the browser and its version being used for the test execution. Testsigma Lab is the Execution Model we have chosen. Click on Create and Run. Wait for some time once the Execution is started and click Refresh. That's how a web application automated test case is created and run.